Here’s Lulu, our new puppy. At only 3 months old, she displays everything we love about dogs: affection, curiosity, a certain sense of humour, and – specifically for her breed – a good dose of stubbornness. I often wonder what goes on in Lulu’s head when she stares at me. Is it a mere plea for a treat or is it something else that she wants? Although we will never know, there are probably many answers to this question. All of them likely have one thing in common: staring into our eyes allows these domesticated descendants of wolves to establish a bond. As someone who has been interested in cyclic peptides for a while, I chuckled when I found out that, on a molecular level, the tie that binds us involves a familiar chemical. In a paper recently published in Science, Japanese researchers presented evidence suggesting that there is measurable feedback that links human oxytocin levels with those in their pet dogs. The authors measured changes in both the dogs’ and the owners’ urinary oxytocin levels before and after their interaction, discovering large and correlated (!) increases in oxytocin concentration in both species. A control group of human subjects under investigation was also made to stare into wolves’ eyes. Nothing happened: there were no recorded oxytocin changes in either wolves or humans as there does not appear to be any cyclic peptide-driven communication between us and those predators. N-Acyl pyrroles are fascinating amides due to the aromaticity of the leaving group when the time comes for the corresponding tetrahedral intermediate to collapse. Fukuyama’s method to make acyl pyrroles starts from the tetramethoxy derivative shown below. The amine intermediate obtained by a straightforward sequence is converted into an N-acylpyrrole under acidic conditions. The fact that Boc-L-phenylalanine can be converted into the corresponding N-acylpyrrole without racemization is particularly striking. While in Brazil 2 weeks ago, I heard Professor Ludger Wessjohann talk about an adaptation of Fukuyama’s N-acyl pyrrole sequence in the area of multicomponent reactivity. You probably guessed that this involved making a convertible isocyanide. As a result, it is now possible to treat a range of Ugi-based products and cleanly generate the products of acyl transfer to your favourite nucleophiles. Treating nitrogen with respect is one of the things I have learned to appreciate over the years. No other element has so much going for it, especially under seemingly trivial conditions and in mundane settings. When Iain Watson was doing his PhD in my lab, he stumbled upon an effect that helped shape our thinking for many years. At that point of time, we had just started looking at the properties of amines in constrained environments. Iain discovered that aziridines displayed some aberrant behaviour in palladium-catalyzed allylic amination reactions. The kinetic branched product never isomerized into the linear one, which was odd considering what had been known prior to our work. We spent several years trying to understand this effect; several generations of my students took those results further and developed some rather nice methods. The irony is that we still have arguments about the origins of allyl aziridine stability against isomerization. But then again, at least the experimentally observed aberration was at the very “start” of the cyclic amine series, allowing us to end any argument with “Oh well, these rings are seriously strained after all… Let’s just go have a beer or something”. You probably know how circular arguments develop and propagate. Now hold on to your seats. Professor Igor Alabugin of Florida State University sent me a really nice book chapter he has been writing. In it, he elaborates on the s-character trends in the secondary amine series and cites a paper that made me scratch my head. This 2014 Nature Methods piece prescribes the use of azetidines (four-membered heterocycles with one nitrogen) in order to dramatically boost the quantum yield of certain fluorescent dyes. The three- and five-membered congeners are both inferior in this application, whereas the four-membered one hits the sweet spot. Today I learned the sad news: Boz passed away. For those of you who hear this nickname for the first time, this is how Professor Brice Bosnich has been known in the chemistry community. There are many admirers of his work out there, which is a testament to the mark this man has left on the field of organometallic chemistry. Before finishing his career at the University of Chicago, Boz was a faculty member at the University of Toronto. I met him on a couple of occasions (although I arrived to Toronto after he had already been gone) and got to appreciate his uncompromising ways. I can tell you many stories that outdo one another in their political incorrectness. But that’s not the point today. We need to remember Boz for what he did in round bottomed flasks, where he turned many a molecule into a frenzy. Which Boz’s paper I like the most? The answer is clear: it is the one that raised my eye brows. In 1991 Boz published a curious report of the rearrangement of allylic alcohols catalyzed by rhodium complexes. What’s interesting is that enols produced during this transformation are stable against ketonization. While something like this would be a heresy in the presence of water, it is entirely feasible in an organic medium such as acetone, provided that protons are excluded. 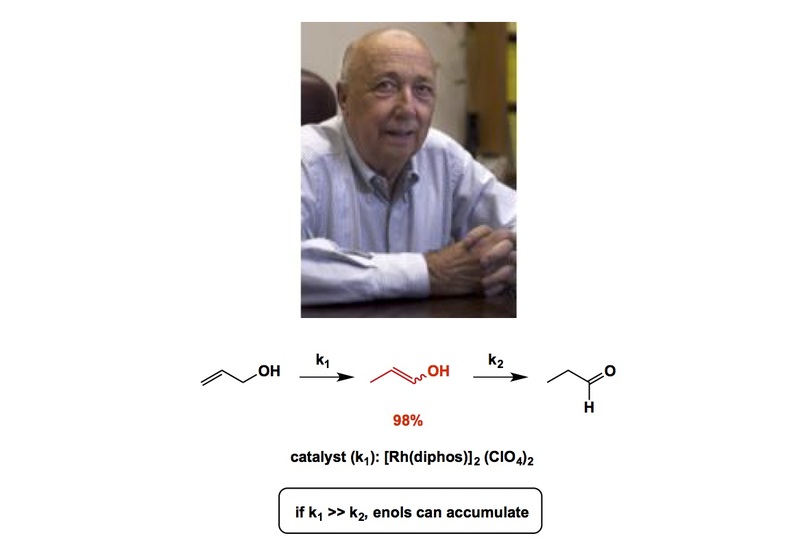 The trick to avoid ketonization is to ensure that allylic alcohol isomerization is much faster than subsequent tautomerization. That’s it, deceptively simple and nuanced. As a result, we have the most effective method of generating enols in aprotic solutions. RIP, Boz. We tend to come across bisulfite adducts of aldehydes fairly infrequently and mostly as a means to get rid of aldehydic traces during work-up. I distinctly recall learning this in my undergraduate chemistry lab many years ago. Remember all those “magical” tricks – decolorizing charcoal, sodium bisulfite, etc? Bisulfite adducts can pull their own weight, though. It has been demonstrated that these compounds are there to not only transfer aldehyde impurities into aqueous phase, but to reversibly protect sensitive molecules. I have been fascinated by these compounds, but I have never seen their solid-state structure. Over the years, I have been searching the Cambridge Crystallographic Database (CCD) in hopes of looking at the crystalline forms of these compounds, but it was all in vain. Last night I came across a paper published in 2013 by the scientists from Eli Lilly. This manuscript has several nuggets that are worth considering. First of all – there you have it – a crystal structure! It is too bad that our colleagues in industry are not always vigilant about depositing their crystallographic data into the CCD, otherwise I might have seen this report earlier. The cation screen is the most peculiar part of the paper. Why does it always have to be sodium bisulfite? This is a great question. 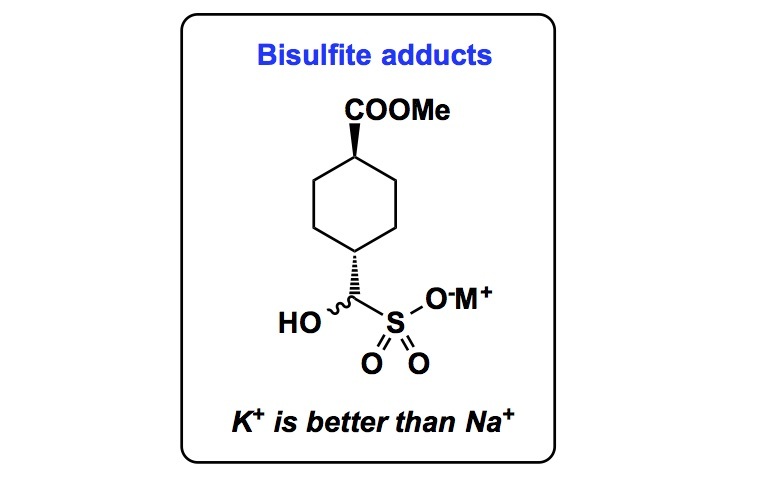 The report by Kissane and Frank shows that potassium salts possess superior properties, at least with their aldehyde. There are additional attributes that were considered by the authors. When was the last time I thought about filterability as a go/no go decision? I can’t recall… This is clearly important in process chemistry. Hygroscopicity is another metric that we do not take seriously in academia (at least not in quantitative terms). Here is a quote: “In a variable humidity solid state experiment, the sodium bisulfite adduct 2a was found to be quite hygroscopic, with a weight gain of 27% at relative humidity of up to 95%”. Hey – now I know why “academic yields” are often inflated… We just don’t think too much about weight gain along similar lines (this is a sarcasm). In fact, a wide range of oxidation states (5 in this case) can be accessed by varying the π-system of the ligand. There are many applications one can imagine for this bimetallic framework in catalysis (particularly in multielectron redox reactions), which is something I am sure we will see in due course. Acid fluorides are enigmatic compounds that can often withstand aqueous conditions. This happens to a certain degree, of course. Relative rates kick in at some point and reactions with nucleophiles do take place. Heck, this is why we love these intermediates, not to mention the corresponding acid chlorides. Acid chlorides partake in the best organic reaction I know – the Schötten-Baumann process. The fact that the classic version of this reaction is carried out in water/dichloromethane is one of the best ways to illustrate to virtues of kinetics in chemistry, especially when you also teach that acid chlorides are hydrolytically unstable. Organic chemistry is indeed a study of contrasts. But let’s get back to acid fluorides. The following molecule, made by Lavilla and co-workers from Barcelona, Spain, is one of the most bizarre acid fluorides I have ever come across. I heard Professor Lavilla speak about this chemistry last week in Brazil. The synthesis is pretty fascinating and hinges on El Kaïm’s finding from many years ago. That report documented some peculiar reactivity between isocyanides and fluorinated acid anhydrides. The mechanism proposed by Lavilla hinges on destroying the CF3 group. As someone who worked on trifluoromethylation in the past, I cannot say that I know many good methods of monofluorination that have CF3-containing starting materials. There is a neat application of Lavilla’s zwitterionic heterocycle as a sensor of histamine. It is remarkable that the compound works well in cells. Histamine Blue (the name of this new dye) shows good selectivity over a range of metabolites in live RBL-2H3 basophils.